Qualified accounting professionals working in the US or other parts of the world hold the title of CPA which stands for Certified Public Accountant. It is a license that allows qualified professionals to offer standardized accounting services to the public. It is equivalent to the title of a Chartered Accountant in India and is a globally recognized profession where only qualified accountants are hired across diverse industries and sectors. Lets check CPA Program details. To become a certified public accountant, one needs to pass the exam moderated by the American Institute of Certified Public Accountants. The CPA Program is ideal for anyone who is looking for a rewarding career path in the field of accounting. This article sheds light on all the details you need to know about the CPA Program, CPA exams and more. If you intend to understand how CPA is different from other courses like CFA and ACCA, this article should help you out. As a CPA Program aspirant, you have multiple ways of becoming a part of the world’s most significant accounting network – the CPA network. Before you understand the technical prerequisites to be eligible for the CPA testing, you need to first understand if your country is recognized as a jurisdiction participating in the exam. Though the testing process for the US and international candidates is the same, there are a few things you should know. The National Association of State Boards of Accountancy has liaised with Prometric to conduct the CPA exam. This provides opportunities for citizens living in countries like Japan, Kuwait, Brazil, Bahrain, The United Arab Emirates, India, etc. to be eligible for the examination. The complete list of participating countries is mentioned here. Besides, some states also require a minimum work experience for application. However, some states like Massachusetts or Colorado are flexible with the requirement on work experience if you have a qualification more than what the state recommends for eligibility. To apply for the exam, you need to first contact the Board of Accountancy in a US jurisdiction to collect all the necessary application materials. The laws for the CPA program differ from one state to another and not all the states participate in international programs. You must choose the state through which you intend to apply. The state you decide on also fetches you the corresponding license to work in the state. Once you complete the application process and pay the fees, you will receive the NTS or the Notice to Schedule, which you can use to take up the examination. The exams can only be taken at an international testing centre. If you are in India, you can take the exam in the Middle East or the USA. Once you register for your exams, you have to wait for a minimum of 24 hours to schedule an appointment for a testing centre organized by Prometric. 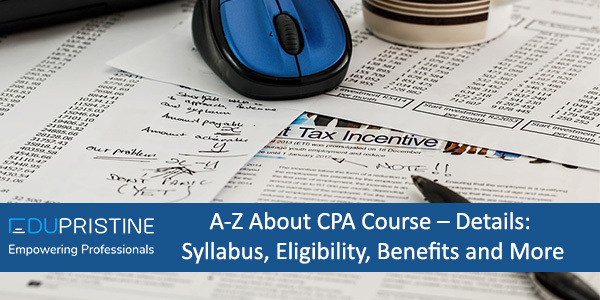 To help you understand the CPA program syllabus, here is an extensive write-up. How Much Does It Cost to Become a CPA? A CPA exam consists of four sections and these sections are designed to test the various aspects of accounting services. You need to pay a separate examination fee for each of the sections, along with a domestic testing fee. If you are calculating the estimates for the CPA exam, also include the expenses involved in visiting an international test centre, the visa expenses, and other allied travel expenditures.The fee for a CPA program is separate if you intend to work on your technical skills before applying for the exams. The test comprises of a section of multiple choice questions, task-based simulations, and a section that tests your written competencies. Is It Worth Doing a CPA program ? An examination with such stringent rules and moderation naturally comes with its own perks and credibility. Like we mentioned, the CPA program is governed by AICPA – the world’s largest body of accounting professionals. One of the major advantages of doing a CPA program is international exposure. Once you pass the exam, you obtain a license to work and be part of the AICPA. The license will make you eligible to practise in the United States, propelling an international career path. The license is your golden ticket to a lucrative career and helps you stand out amongst your competition. Also, having a CPA license helps you make 10 to 15% more salary than your non-licensed counterparts. This resourceful article should help you out with more information on the benefits of doing a CPA program. How Hard Is It to Become a CPA? Becoming a CPA is a standardized procedure, where rules and regulations have been well laid out by the governing bodies for recruitment and licensing. However, the difficulty is subjective and depends on your preparation. You have to master the four sections in the syllabus to pass on the first attempt. To help you out with the preparation, there are several qualified institutions like Edupristine that provide training on the CPA program. A guided training is always better in professional exams and at Edupristine, we dedicate our time and efforts in bringing an airtight program content that complements your vision of cracking the CPA exams. Our faculty’s experience and expertise bridge the gap between what you need to learn and what is asked in the exams. Besides, learning with Edupristine is also self-paced, where you can get back to concepts you did not understand for more comprehension. This is possible because of the access you get to the recordings of your classes. We are Becker’s official training partners for CPA classes in India and all our course/program material is from Becker’s. Those of you looking to make it big as a CPA should look for an ideal start with an institute like Edupristine. Get in touch with us to get started with the CPA classes.